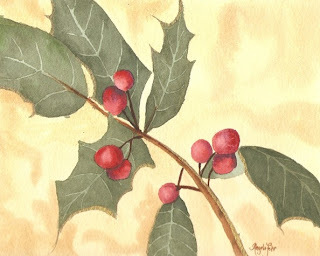 This little holly painting was one I did as a demonstration for a watercolor class. I enjoy teaching, there is something very neat about seeing students learn and implement watercolor techniques and explore their own creativity. I like to teach the basic techniques, rather than focus on developing a style, since, and then to watch as my students get comfortable and use those techniques to put their own unique vision onto paper. This painting was done after we had already finished lesson #1, the "cheat sheet." Once we do a brief run-through of the most common watercolor techniques (wet-in-wet, drybrush, washes, lost-and-found edges, etc. ), they have a "cheat sheet" to refer to every time they paint. Then we do some step-by-step projects, of which this was one, and then some independent projects which I supervise and give guidance to. Usually we do about 8 two hour sessions, though I have also taught weekend greeting card painting workshops. We had some fun finishing this painting off with iridescent medium and gold ink for accents. And it was a great exercise in negative space (see the veins on the leaves), which some students have trouble with. I didn't think of it last year, but I might use it for my Christmas card next year. For more of my painting demonstration online, click here. To book a class, contact me.